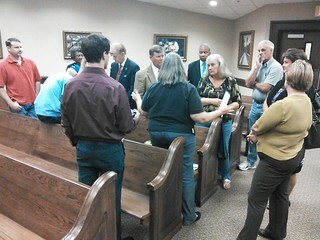 We returned from the Lowndes county commissioners meeting October 22nd. I requested that they formally announce that they are against the proposed pipeline. Provided them a Georgia statue that they could use to file their concerns and protest against the route of the proposed pipeline. I was advised that this would be investigated. I am very hopeful that our county commissioners will act. There were a few very concerned citizens who attended the meeting tonight. I am encouraging everyone to become involved. Every voice counts. Please visit the Federal Energy Regulatory Commission (FERC) and file a comment to register your objection to the pipeline. I suggest you also object to the heavy handed way Sabal Trail is threatening property owners with Eminent Domain. Do not sign anything given to you by the pipeline companies. Do not be BULLIED.